MUMBAI: The NY-based DJ-producer Brooklyn Shanti, who was featured at Summer House Cafe, Delhi yesterday 8 March 2017, showcased sounds and styles that champion underground music culture. 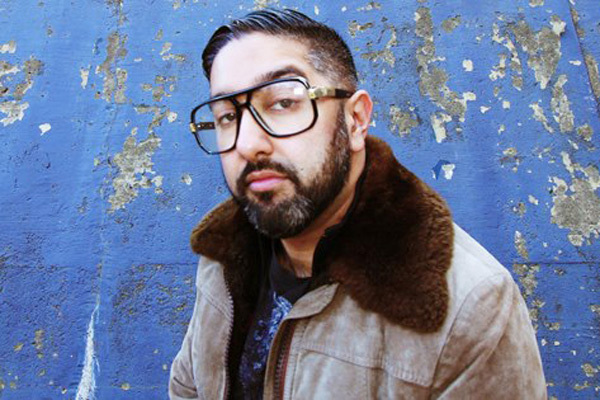 Nabin, aka Brooklyn Shanti, is widely regarded as an accomplished DJ-producer, emcee. Also, he is a pioneer of Global/Tropical Bass/Dancehall fusion and is deemed hip-hop’s official cultural ambassador to India (UZN). He played as a part of the first-ever Boxout Wednesdays, a weekly residency at Summer House Delhi. These weekly gigs will be streamed live on Facebook and help build a community that is un-served by mainstream media. In an email interaction with Radioandmusic.com, Brooklyn Shanti shared his earlier days, his idea of sound, nitty-gritty about making music, his knack for knowing the combination of sounds, visuals and technological techniques, inspirations, his record label Someplace Called Brooklyn, his upcoming collaborations, projects and more. Your music is advanced and experimental; how did it start? Did you always want to become a musician? Tell us more about it? I started freestyle rapping at the age of eight and was in a pretty serious rap group and touring by the age of 12, and that was the beginning. I did have a DJ I was working with at the time, Thomas Blondet, and a lot of friends I was recording with. Since nobody had access to a proper recording studio, I rigged one together and that was the beginning of my producing and engineering passion. It was always hidden behind my passion of being an emcee. Fast forward a few decades, as it turns out, I’ve always had a knack for knowing what combination of sounds, visuals and technological techniques will be widely accepted once presented to a larger audience in different contexts. It has been almost two decades that you have been experimenting with sounds, how would you describe the progression? Also, how would you describe your music? I just go wherever I am interested. It’s a fairly intuitive process. Generally, by the time the public embraces a certain type of sound, I have moved onto something totally more captivating and ‘interesting’ to my mind. At Someplace Called Brooklyn, my label, we hold onto releases sometimes up to five years, as we wait for the mass audience to shift in the direction/mood I was in so many years ago. For that reason, I can only call my music a specific Bengali term: Nabin or forever youthful. That also happens to be my name. What does your stage name 'Brooklyn Shanti' stand for? Brooklyn Shanti has many meanings – mostly because it is symbolic of a time when I shifted from being known primarily as a rapper to becoming a full-time producer, DJ and curator. I rap under the name, the1shanti. It’s been many years since I’ve released work under that name. In Dutch, Brooklyn translates to being a body of land broken by water. For me, that’s how I see the Earth – and Shanti, of course, is the state of tranquillity. Brooklyn, New York, has also been my home for the majority of my life. The name stands for this current body of work I’m creating and sharing around the world, including all the lengths I’ve gone to in order to bridge the gaps between the artists I really admire and work with such as Thornato, Tittsworth, Thomas Blondet (still to this day), Bajah, Teleseen, Dani Mari, Koushik (Basmati Brothers) and so many more. I’m hoping it brings some peace and harmony to all our people. How does the creative process work and how do you fuse various elements while structuring a track? Are they just a result of quickly shifting moods? These songs come to me in final form. I hear something in my head and then it becomes a race to reverse engineer the thing and get it as close to what that original vision is. You can put me in the room with a band, or a vocalist, or an orchestra, the process is the same. Something comes to me in a moment’s time and then we’re off to the races. That, of course, is the result of living in an inspired way, which supports these types of sudden bursts. It can take either five minutes to get to the finish line or a week of non-stop/non-sleep cycles. Every piece is different. Is it essential for a composer to have an advanced understanding of numerous instruments? Not an advanced understanding per se, but learning the basics, yes. Especially when someone is dealing with electronic music, it is a must. You absolutely must know how a rhythm section works and how to keep your groove in the pocket. You have to understand sonically how to bring certain frequencies in and out of your compositions. I’m not saying you can’t experiment to the highest degree, but there are hard and fast rules that everyone must follow. What is your take on the youth who are inclined to Bass, electronica and hip-hop music? Do you think people are growing their musical knowledge over time? When I started, there were almost zero South Asian/Asian youth who were into all of this. It’s great to see something you envision as a child blossom and become embraced worldwide, knowing that you have had even a tiny contribution to that. Some would argue I helped to pioneer a few different movements, so I’ve been waiting for this particular moment for quite some time. As a producer, traditional hip-hop culture demands that you have a working knowledge of many fundamental catalogues – such as Stax, P-Funk, Motown, etc. in addition to knowing certain musicians, from Bob James to Ron Carter, to name a few. I come from the generation where even when I transitioned into what became ‘downtempo’ and ‘lounge’, I knew the history of Kruder and Dorfmeister, as Dum Dum Project, we were contemporaries with Thievery Corporation and the likes. When I was being asked to remix stuff on Bukem’s Good Lookin’, I knew my Drum n Bass. I had to travel the world, create dig, really sit people down, and get educated. Now with the internet, sounds and midi files are there to download at the click of a button. It’s not difficult to create something using harvested work from many sources, which a DJ can drop at a club 24 hours later. If at a young age a budding musician/artist doesn’t begin the path of educating themselves, none of the success will have any intrinsic value. There will be no passion behind the expression – it will just be mechanical. Where it goes, we will have to wait and see. As for the people I’m grooming, I ensure the passion is present in every step of the process. The genre of electronic music is vast. Being a pioneer of global fusion and electronica, also hip-hop, how do you view the two genres in India? Rahman in 2000 to remix things into hip-hop. I was part of Swaraj, the UK movement that followed Talvin Singh’s Anokah. Prior to that, I was part of the movement that birthed the Rawkus era in hip-hop. It is the combined work of these collective ideas and people over the years that you can even have someone like my friend Nucleya emerge at the level that he is on now. This period is just the tip of the iceberg. Hip-hop has never been given its fair chance in India. I know this personally, as the one from New York who has been the constant voice behind the scenes trying to help guide directions. We’ve seen where things go when you sell out and want money and brands. Trust me – I’m here to keep it underground and indie so that we can grow and flourish. All of us have to keep in mind that we need to concentrate on strengthening the art and making our voices collectively louder. Only then the money will come and the corporations not manipulate our artistic process. We all need to work together on these aspects. Everyone wants what we have, let’s be smart about how we decide to give people access to it. You have collaborated, worked with different musicians, any notable experience you want to share with us? How challenging is it to collaborate with so many musicians? The key to successful collaboration is to put your ego in the back seat. Trust the creative process and know the best expression will be the result of your combined energies. I love collaborating because, through each and every piece, I learn an infinite amount about someone else’s process, which is brain candy for me. I’ve actually kicked it up for this year – I’m collaborating on new music every week and releasing a newly finished video on YouTube every Wednesday. Tell us more about your record label Someplace Called Brooklyn? Someplace Called Brooklyn is my incubator. I bring people in and out as needed, and create work in order to teach them techniques either in the studio or in business. It’s a real family vibe. You have played across the globe, also in India before. What is your favourite venue? Among one of my favourite nights in the past has been these dirty peel sessions at a place called TLR in the old HKV – I’m talking 10 years ago when the scene was just a few of us. There were particular nights you could catch me, Thornato, Alo Wala, Mo City & Reggae Rajahs, Su Real, Nucleya and the rest of us just having a laugh and really playing music for each other while having a crowd in front of us. Really underground and hospitable family vibe. Things are done the right way. How different is it performing in India, compared to abroad? I know that with every show in India and every release, I’m making an impact. A small dent into the cosmos of musical identity. I know that we all want the same thing – to see this scene succeed and have ‘our own’ artists have worldwide exposure, and to do it with integrity. When in India, I’m in a workshop. When I’m abroad, I’m full force feeding people what I have already created. That’s the main difference. Music influences that you would like to mention? Camp Lo, A Tribe Called Quest and De La Soul always. Homies like Tittsworth, Thornato, Thomas Blondet, Uproot Andy and Captain Planet always keep raising the bar for me. I live in the intersection of those vibes. Your last album ‘Bedstuyle’ was released in 2014. Apart from gigging, would you like to throw some light on your upcoming projects? Check out Basmati Brothers, it’s my new hip-hop project with Ko the Timeless (www.basmatibrothers.com). We have a mixtape for download now and an album releasing in the next few months. I have a Bengali ‘Bangla Bass’ album that is finished and that will release this year too. I have a collaborative album finished with Dani Mari scheduled for release end of the year. I have my next Brooklyn Shanti production album wrapped up as well. We are in the various stages of filming the videos for all of these releases and they will be out this year! If not making music like this, what do you see yourself doing 10 years from now? Music will always be there! I’ve been directing/shooting/cutting music videos and documentary films over the last few years. I’ve started writing seriously as well. I’ve been mentoring a number of artists. Whatever happens five years from now, it won’t be boring – that’s for sure! Last but not the least, people who do not know, he doesn’t have a tattoo. Interestingly, he has a library of compositions he has created as ‘modern elevator music’. Also, he is slightly obsessed with female singer/ songwriter pop music from the early 2000’s. Lastly, you will be surprised to know that he was Vin Diesel’s body double in Furious 7, the seventh instalment in The Fast and the Furious franchise. Ranjit Barot falls in the rare class of musicians. He is a successful score composer, music director, singer and an exceptional drummer.